Budget Pre-Owned Appliance, LLC offers a wide variety of used washers, dryers, stoves, ranges, refrigerators, freezers, dishwashers, and other household appliances at a fraction of the cost of new. All of our appliances have been cleaned, tested, and guaranteed to work. All will come with up to a 30 day "repair or replace" warranty at no additional charge so you have a little extra peace of mind. We realize that money is tight and we will do our best to work with your budget. We price all of our appliances aggressively right up front but will always offer discounts when you buy more than one unit. Delivery to your door is always available for a small fee and we can even haul away your old appliances at no charge (see us for details). If you have an older working appliance and would like to upgrade, we offer trade-in deals for a credit towards a newer model! Please stop in and see us, we are quite certain you will be pleasantly surprised at what we can offer. At Budget Pre-Owned Appliances, our selection changes daily. We receive shipments daily Monday through Friday. If you don't see what you are looking for, ask one of our sales professionals and we'd be happy to look for you. Ask us about our convenient lay-a-way program! 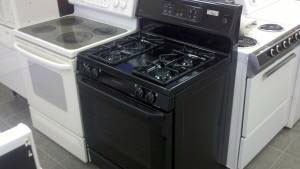 At Budget Pre-Owned Appliances we offer a wide array of used appliances for the home. We have the kitchen covered with our selection of gas and electric ranges, ovens and refrigerators. The laundry room is in the bag with our selection of washers and dryers. 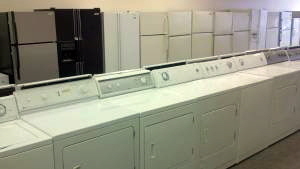 If you have a used appliance you would like to sell, bring it by and we will discuss your options. Attention : Landlords and Management Companies! 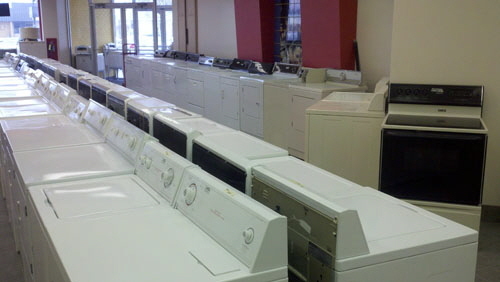 Are you in need of quality used appliances? Budget Pre-Owned Appliances can help you! Purchase refrigerators and/or stoves in quantities and receive additional discounts! Got some appliances you are looking to sell? We will also buy appliances from you. Please call us or stop by for more information.